Where does this blog come from? A friend asked me today how many people work for me helping me write my books and blog. I write every word of this blog (more than 2,000,000 words so far). If you see a book or an email that's from me, I wrote it. I don't actively use Twitter (not because it's not a useful tool for some people, it just doesn't work for me) so I don't need a staff to pretend to be me there. 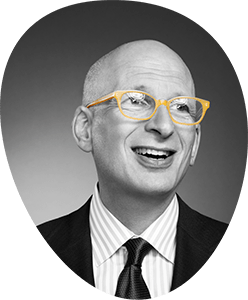 (You can read this blog at @thisissethsblog). I don't actively use Facebook either, though I have a page there. If I blurb a book, it's because I've read it and thought it was worth highlighting. I don't endorse companies or other projects. I don't take pitches to be on my blog, and no one can pay me to endorse them. I don't directly own private or public equity in companies I write about, except for Squidoo.com, which I founded, and use because I like what we built, not because I'm trying to persuade you to use it. And those are my boundaries. They might not be for everyone, and I'm sure that others have other systems that work for them, but there you go. If I fail to respond to an email from you, or read something you send me, it's simply because I've made the choice to be a soloist than to farm out the thing I love to do to someone else. Here's what doesn't work: hacking around and ignoring what doesn't work. Here's what also doesn't work: doing your best with your work and then dismissing the elements that don't work as experiments. The best experiments are experiments on purpose. They are done with rigor and intent. They are measured. They are designed to either fail or create an approach that can be scaled. Great experimenters measure their results. They probe. They fail on purpose. And when they find something that works, they hand the knowledge over to operators and executors who can scale their work. You don't get to call it an experiment after it fails. I found that quote in a strangely-translated instruction manual for an obscure but beautiful trick. But it has wide applicability. Perhaps your anxiety is specific to artists or musicians or to anyone who has to stand up and stand out and stand for something. It turns out that your anxiety isn't specific at all. Perhaps it is due to the fact that you're trying to control things that you can't possibly control. Your anxiety might merely be a sign that you care deeply about your work. Anxiety is almost never a useful emotion to carry around. Even for magicians. Now that you've been reminded that you care, it pays to let the anxiety go. Good riddance. In most large organizations, nothing happens unless at least one of these needs are met, and in just about every organization big enough and profitable enough to buy from you, the order of needs starts with the first one and works its way down the list. That means that a sales pitch that begins with how much money the organization will make is pretty unlikely to work. Instead, the amount of profit has to be tied in to one of the other more primary needs of the person sitting across the table from you (as well as the committee or boss she reports to). B2B selling is just like regular sales, except the customer (who might not be the person you're meeting with) is spending someone else's money (and wants to please the boss). If you've ever fixed any kind of machinery, you know that a device that's exposed to the elements is incredibly difficult to maintain. A washing machine or the underside of a car gets grungy, fast. On the other hand, the dryest, cleanest environment of all is the digital one. Code stays code. If it works today, it's probably going to work tomorrow. The wettest, weirdest environment is human interaction. Whatever we build gets misunderstood, corroded and chronic, and it happens quickly and in unpredictable ways. That's one reason why the web is so fascinating–it's a collision between the analytic world of code and wet world of people. No software design survives a collision with the user. It's a mindset, not just a job. You can pitch them as hard as you like about having them work to persuade their patients to give up smoking (after all, it saves lives in the long run), but I think you'll find that they're a lot more interested in stopping the bleeding. We need emergency room doctors, no doubt. I just wonder if we have too many of them in your organization. If all we do is reward fast first aid in what people do at work, is it any wonder we don't have enough attention to the strategy and choices that would eliminate the need for all that running around in the first place? It helps to know how prevalent the "emergency room" culture is before you start training your people on a new long-term strategy. I apologize if you see the world with more frustration after this. I love watching contrails, those streams of white frozen exhaust that jets leave behind. It's a temporary track in the sand, and then the sun melts them and they're gone. Go to Montana and you might see the tracks dinosaurs left a bazillion years ago. Same sort of travel, very different half-life of their passage. All day long you're emailing or tweeting or liking or meeting… and every once in a while, something tangible is produced. But is there a mark of your passage? Fifty years later, we might hear a demo tape or an outtake of something a musician scratched together while making an album. Often, though, there's no trace. I'm fascinated by blogs like this one, which are basically public notes and coffee breaks by a brilliant designer in between her 'real' work. Unlike tweets, which vanish, Tina's posts are here for a long time and much easier to share and bookmark. Her trail becomes useful not just to her, but to everyone who is interested. What would happen if you took ten minutes of coffeebreak downtime every day and produced an online artifact instead? What if your collected thoughts about your industry became an ebook or a series of useful instructions or pages or videos? If you build your business around being the lowest-cost provider, that's all you've got. Everything you do has to be a race in that direction, because if you veer toward anything else (service, workforce, impact, design, etc.) then a competitor with a more single-minded focus will sell your commodity cheaper than you. Everyone needs to sell at a fair price. But unless you've found a commodity that must remain a commodity, a fair price is not always the lowest price. Not when you understand that price is just one of the many tools available. A short version of this riff: The low-price leader really doesn't need someone with your skills. I hope you'll find a gem or two.